Debunking Christianity: Dear Christian, Would You Kill Your Kid for God? Dear Christian, Would You Kill Your Kid for God? Christian parent, I have a question for you. Would you be willing to murder your child to prove your loyalty to your boss? You would look at your boss like he was insane, and refuse to do it – right? I hope that I am right in assuming that all of you would refuse such a vile request. Let’s up the stakes a little. What if – instead of your boss – it was your god who told you to kill and sacrifice your child - to demonstrate your faith? Would you do it, or not? Wouldn’t he? It’s exactly what the Bible claims that Elohim asked Abraham to do. As Christian, aren’t bound to obey whatever command your god was to give you? Doesn’t your god’s will supersede your own desires? So why are you balking? Still not willing to say that you would kill your kid for your god? Oh ye of little faith! The mental struggle and tension you are feeling is a conflict between what your innate love, empathy, and reason tells you (murdering my child is horribly wrong) and what your religion tells you (obeying my god is always right). Can you see how insidious it is that your religion and Bible present something as vile as child-murder and human sacrifice as good, when commanded by your god? Why then do so few Christians seem bothered when they read, or hear sermons about this story? True, but according to the story, he was in the process of carrying out the murder of his son, until an angel stopped him at the last second. 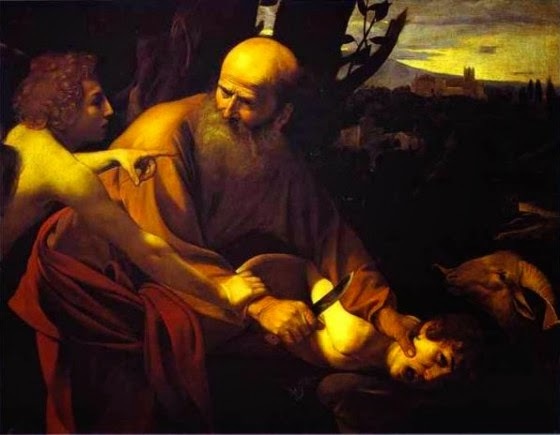 Abraham was fully willing to murder his own child, to please his god, and the Bible praises him for it. As to the ‘testing’, why in the world would a god who know all things (including the hearts of men, according to the Bible and Christian belief) need to carry out such a sadistic test? An all-knowing god would know exactly what Abraham would do already, so it would be a pointless exercise. Hebrews 11:19 speculates that Abraham was willing because he believed that his god would raise Isaac back from the dead, after he killed him. It is quite possible that a deranged mind might rationalize the act in this way, but it does nothing to remove the horror and immorality of it. Ah yes, a human sacrifice which was to be a beautiful foreshadowing of another human sacrifice… lovely! § Do you think that it is right for human beings (especially children) to be used as mere objects - pawns -as a kind of twisted sermon illustration? § If you tried to murder your child in the name of religion, but stopped at the last minute, what harm do you think that would do to your child’s mental state and to your relationship with that child? I regard the Bible’s celebration of a parent who is willing to murder his child and offer him as a human sacrifice to be both immoral and evil. The story is presented in such a way in Christianity, as to desensitize the reader to the true horror of what is going on. The reader’s loyalties are directed away from the child-victim, and aligned to the perpetrator (Abraham) and the instigator (Elohim). This is dehumanizing, and a perversion of morality. Christian reader, if after viewing the clip, if you are more bothered by Hitchen’s f-bomb than you are by the fact that your religion romanticizes a parent being willing to murder his child, then I would suggest that your moral values are seriously deficient. If you are troubled by the Abraham/Isaac story, and would not be willing to kill your child to prove your faith, then congratulations, you are more moral than the god you worship. If this is the case, then please ask yourself why you are worshipping such a god. A god who would ask a parent to murder their child is not loving, moral, or holy, and is certainly not worth of worship. A book which promotes such an immoral act disqualifies itself as a source for morality. Why not do the moral thing, and reject the Bible and it’s sadistic god?